Parker Dunshee probably doesn't want to see 2017 come to an end. The Oakland right-hander extended his scoreless streak to 38 1/3 innings in Class A Short Season Vermont's 2-0 win over Hudson Valley on Thursday at Dutchess Stadium. In three frames, Dunshee scattered two hits and fanned three, throwing 32 of 44 pitches for strikes. "It's pretty weird," the Indiana native said of the run. "I don't really think about it that much. I try not to, but obviously, all the guys on the team are letting me hear it every day. It's been fun to play with this team. We've got a pretty good group and hopefully we make the playoffs with a good push this last week." While Dunshee didn't allow a hit in the first inning, a passed ball by catcher Iolana Akau allowed Tampa Bay's No. 3 prospect Brendan McKay to reach on what would've been an inning-ending strikeout. Akau atoned in the second, throwing out Oscar Rojas to complete the double play after Dunshee struck out Rafelin Lorenzo. Dunshee had walked Isaac Benard and allowed a single by Bill Pujols to short, but escaped when Deion Tansel flew out to left fielder Greg Deichmann, Oakland's No. 16 prospect. "You can kind of feel it tense up [with men in scoring position]," the 2015 seventh-round pick said. "I try not to and just take a deep breath and make the next pitch. I had a bunch of nice defensive plays that helped me out -- the strike-him-out-throw-him-out, a couple double plays and Deichmann make a nice play to end the second." Dunshee retired the side in order in the third, getting Vidal Brujan to ground out to second before fanning Carl Chester and inducing McKay to ground out to first. 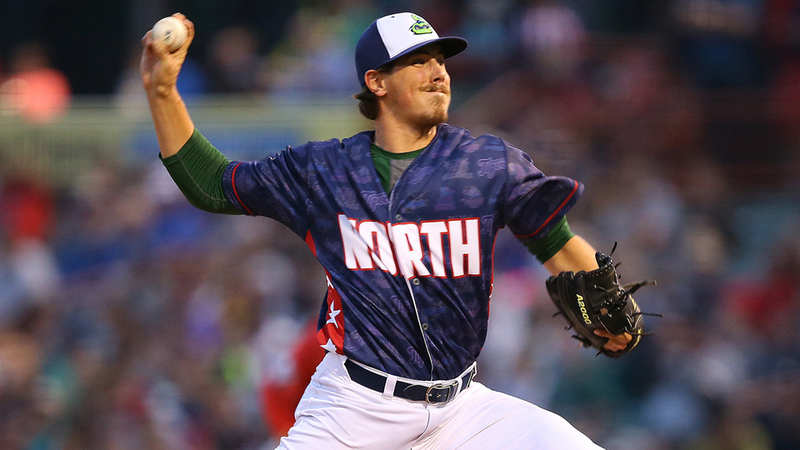 Since struggling in his pro debut in the Rookie-level Arizona League, where he allowed three runs on five hits over two innings in his lone appearance on the circuit, Dunshee has been lights-out with the Lake Monsters. In 12 appearances, including nine starts, the Wake Forest product has allowed more than two hits in a game once while whiffing 45. "[The key] has been my ability to command the fastball -- it's been pretty good since I've been here in Vermont," Dunshee said. "The outing I had in Arizona it wasn't good; I was leaving balls up and out over the plate. I got here, made the adjustment to keep the ball down in the zone and work both sides of the plate. It's been working pretty well up to this point." Dunshee has surrendered 15 hits and eight walks for a 0.60 WHIP to go with his spotless ERA. What stands out to him most about the streak has nothing to do with his performance, though, but the contributions of others that allowed him to reach this point. "I've had a couple times where there have been men on first and third with one out and had double plays rolled," Dunshee said. "The defense has picked me up those times. Those are probably the highlights, because everybody is thinking about it with guys in scoring position. I think I've had three double plays rolled with men on first and third, and that's just a tribute to the defense and the guys behind me." Brian Howard (2-1) relieved Dunshee with three perfect innings and has retired 43 of his last 48 batters. The right-hander's given up three hits and one walk while striking out 14 over 15 scoreless frames during that stretch. Branden Kelliher, Logan Salow and Jeferson Mejia combined on the final three hitless frames for Vermont. Akau and James Terrell drove in a run apiece for the Lake Monsters, while A's No. 29 prospect Will Toffey, Logan Farrar and Aaron Arruda each contributed two hits.